As we move forward in the world of technology, rumors and leaks continue to jump out of the wood works. The latest rumor we have for you today is about the iPhone 6. 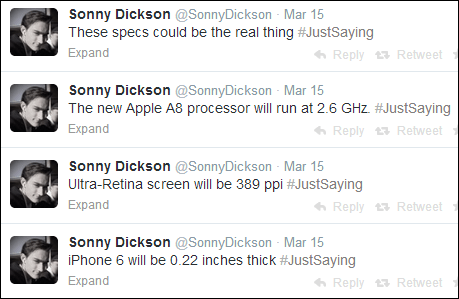 Blogger Sonny Dickson, who has been credited for having hit and misses with his information has tweeted out a few specs about the iPhone 6. Dickson claims that the iPhone 6 will shrink in thickness from its current 0.33 to 0.22 inches. Next up he claims that the new iPhone will feature an Ultra-Retina screen, which means a pixels-per-inch number of 389. He then later claims that the A8 found in the iPhone 6 will clock in at 2.6GHz. We still have a while to go before Apple releases the next big thing, but we will be right here to give you the news as soon as its released.